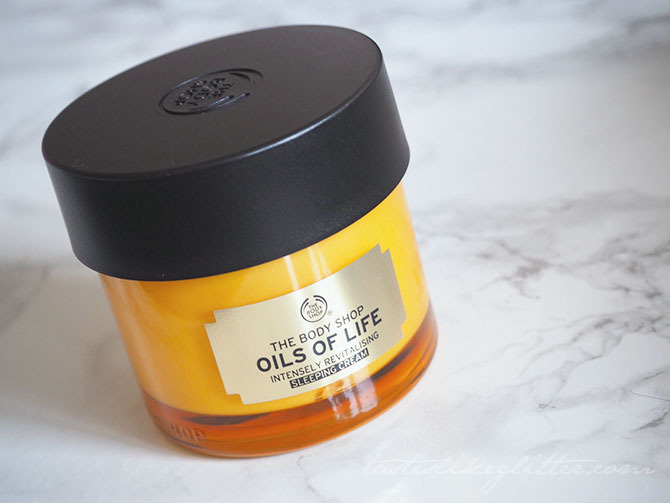 Last year The Body Shop added a new range to their skincare line up, Oils Of Life. The range features an intense facial oil, a bi-phase essence lotion, an intense eye cream and a couple of different moisturisers. 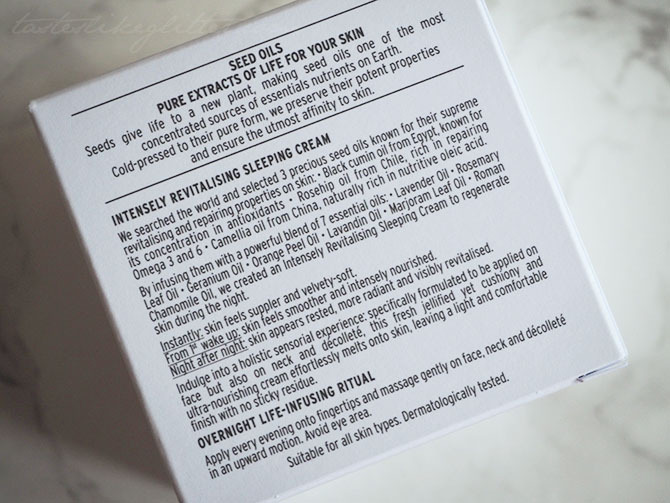 After trying a sample of the oil in a Glossybox last year, the night cream was definitely something that was on my radar. Since I use benzoyl peroxide, my skin can really dry out so I was in need of an intensive moisturiser that really worked. Firstly the packing feels super luxe, the glass jar is thick and weighty so not the best if you want to travel light. Often times the way things are packed look like you're getting more product than you actually are. Upon opening this I was pleasantly surprised to see that the jar wasn't all glass, there was plenty of product inside. 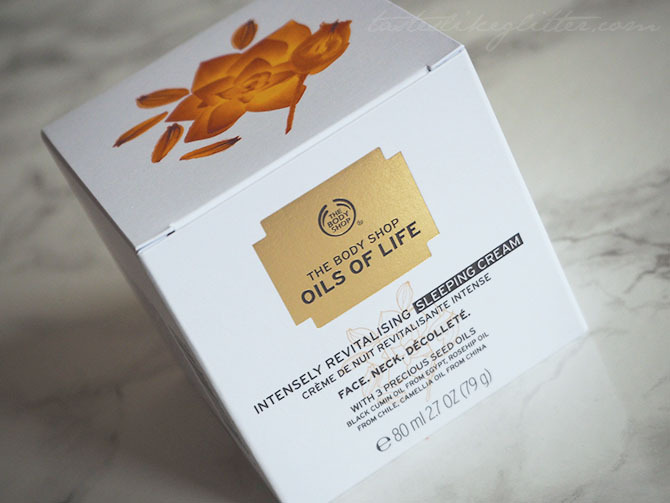 The cream itself is made up from cold pressed seed oils. This form of extraction helps to maintain the potent properties of the oils, without losing any of the goodness. The main three oils in this are black cumin seed oil from Egypt, which helps reduce oily skin and keeps pores from clogging. Camellia seed oil from China which is rich in fatty acids and anti-aging antioxidants. It's really good for keeping skin soft and supple without leaving a greasy feeling behind. Along with Rosehip seed oil from Chile which is full of vitamins and antioxidants, helping to really hydrate the skin and aids in reducing scars. The scent is warm and spicy it's something a little different as far as skincare scents that I've used go. It took a little adjusting to at first as I'm accustomed to fresh, barely there scents. The texture is thick but isn't uncomfortably so. It spreads across the skin easily and sinks in without leaving behind a sticky, greasy feeling. After application, my skin feels fresh, smooth and more supple and nourished. Overnight it helps rejuvenate your skin so you wake up and it feels soft and hydrated. 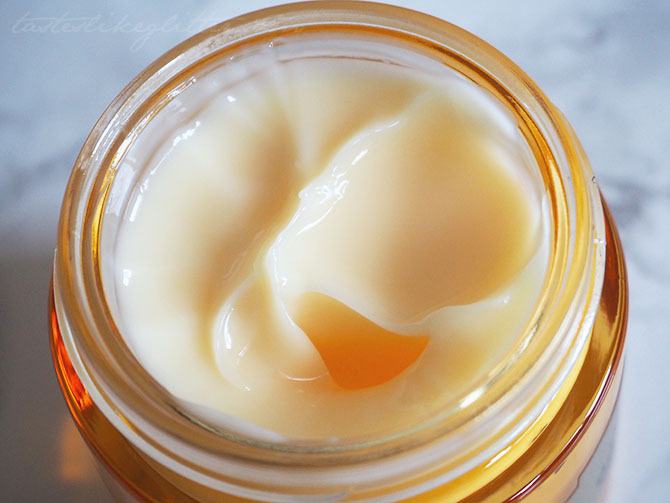 For me, this is the perfect night cream as it hydrates without being overly greasy. 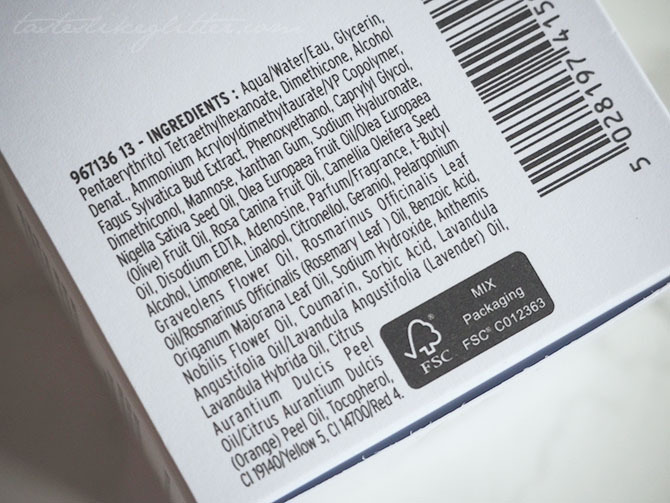 Having combination skin I've always been apprehensive of using too many oils in my routine. Since using this I've seen an improvement in the texture and overall look and feel to my skin, it doesn't get dry anymore and feels a lot plumper. I'd class this as midrange as far as price goes. It's easily accessible on the high street and I really can't fault the product. If you've been on the hunt for a new night cream, I can highly recommend this one.